Your favourite tobacco e liquid is now available in the new 50ml & 100ml bottle formats. Smooth and mild yet distinctly tobacco with just a hint of caramel. Stringent quality control with every bottle. 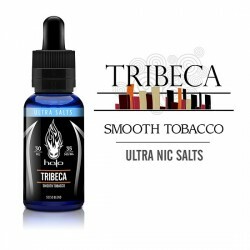 There’s a reason Tribeca is regarded as the top tobacco flavoured E-liquid in the entire industry—and if you’ve tried it, you already know why. Flavour profile: "Smooth tobacco notes blended with just a touch of vanilla and caramel". Steam Age Vape Shop ships Halo Tribeca Tobacco E-Liquid (with nicotine) NZ & Australia-wide. Halo's award-winning Tobacco E-liquid is formulated to provide unprecedented flavour and performance. Each unique flavour is developed under strict quality control guidelines. As part of Halo's dedication to quality and higher standards, all their e-liquids undergo independent laboratory testing: View Tribeca E-liquid's Lab Test Results Here. Read the Steam Age Halo Tribeca review here.